Summertime means camping and delicious smores. Check out this portable safe marshmallow roasting stick. My husband loves to take the boys camping. They go camping at least 2 -3 times a year. When the boys help me make the shopping trip for their camping trip, the first they tell me to add to the list is marshmallows. I then add graham crackers and chocolate bars. My boys get so excited as camping means making s'mores. Do you remember making s'mores as a kid? I do and it was such a fun time, but it was also an unsafe time as I remember getting burned numerous times. I also look back and think about how unsanitary it was as we used sticks to hold the marshmallows. Who remembers searching for the perfect stick? It would sometimes take a long time to find the right stick and I wonder if the sticks we found we even safe to burn. As a kid, I did not care as all I wanted to do was roast my marshmallow and put it between two graham crackers with chocolate. I just loved how the hot marshmallow melted the chocolate and made this treat taste so good. There is a better way to roast marshmallows. 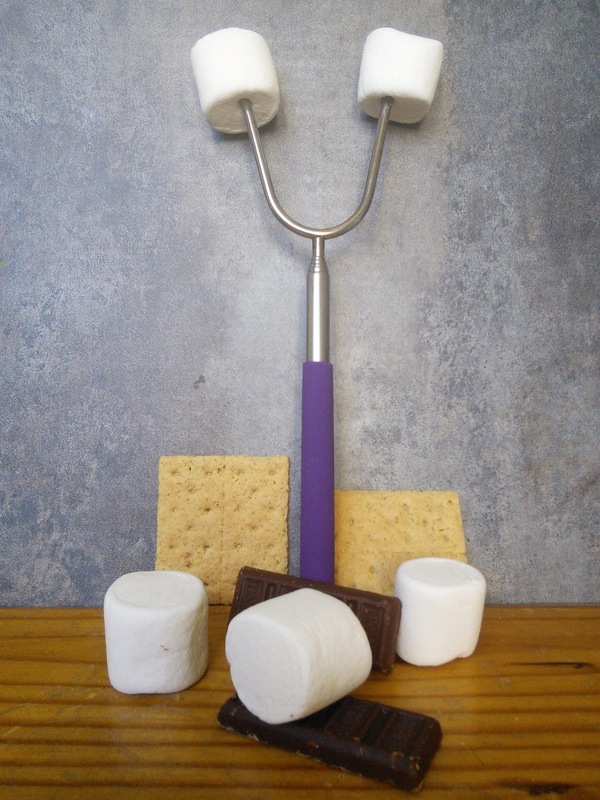 The Marshcone Marshmallow Roasting Sicks are a portable safe way to roast marshmallows over a campfire. I love that they are made from durable stainless steel and my kids don't have to use a dirty stick they may not be safe to burn. These colorful sticks start out at nine and a half inches and then extend to thirty-four inches so your hands and arms stay far away from the fire. My husband loves that they don't take up much space in his camping gear. These 4 extendable forks fit in a nice carry pouch making them easy to throw into a camping bag. The different colors of the forks means no more fighting over whose stick is whose. 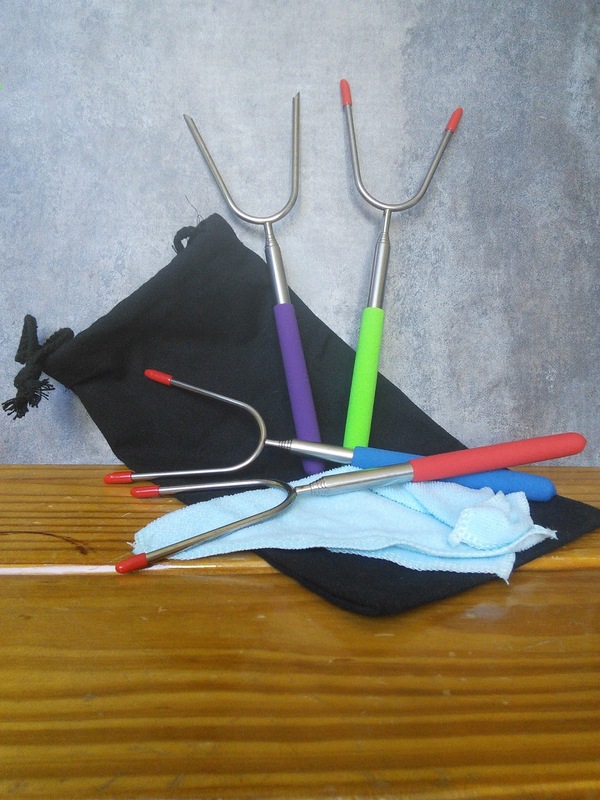 The forks even come with protective removable silicone ends to stick on the prongs so they won't poke any fingers when not in use. So now there is a safer, mom approved, way to roast marshmallows for gooey delicious s'mores. 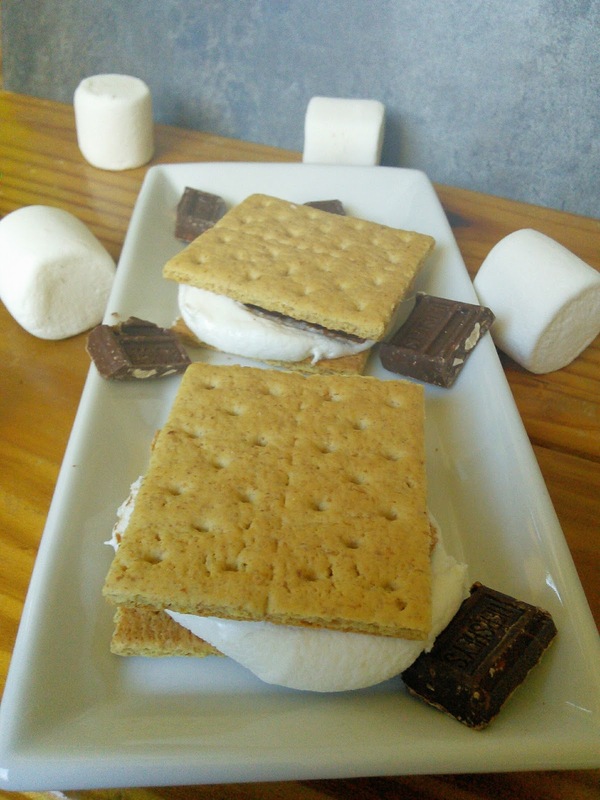 You can even use these at home over a fire pit or barbecue so you can have s'mores year-round. You will be the life of the party when you show your guests these extendable Marshcone marshmallow roasting sticks. They will be so happy knowing that they will be enjoying hot, melted, gooey marshmallows in between graham crackers with delicious chocolate. There’s just nothing that brings bigger smiles and warmer stories than sharing a s’more with someone you care about. These colorful forks are perfect for camping, backyard parties and more. So how do you like your marshmallow roasted? Do you like it lightly brown or burnt to a crisp? "These opinions are my own and I received a set of Marshcone Marshmallow roasting sticks to facilitate this post"
That sounds like a great tool. I need to get one before the summer! We did that here and we just used lighters. It wasn't the safest but it did work out for us. The ones you used thought are far more safe. This is a great product! I need to get some of these!! If you can find me some veggie marshmallows then you will be my fave haha! On another note that is a great safe tool. What a great idea! We roast marshmallows on our fire pit quite often and I'm always trying to keep the kids back. I"ll have to try this out. I wish there was a way to have smores all year round! Great idea with these duo-pronged roasting sticks! Okay, saw the cutest thing the other day which I will be trying. The person took a terra cotta pot lined it with tin foil and filed it with charcoal. Such a very good products to buy very soon. I need these at home. Thanks for sharing. Yum, we sometimes camp and eat marshmallows in our backyard, my little cousins love it! This post made me crave for smores! Love that it's perfect safe and it has a heat proof handle. That's going to be awesome since Spring and Summer are just around the corner! 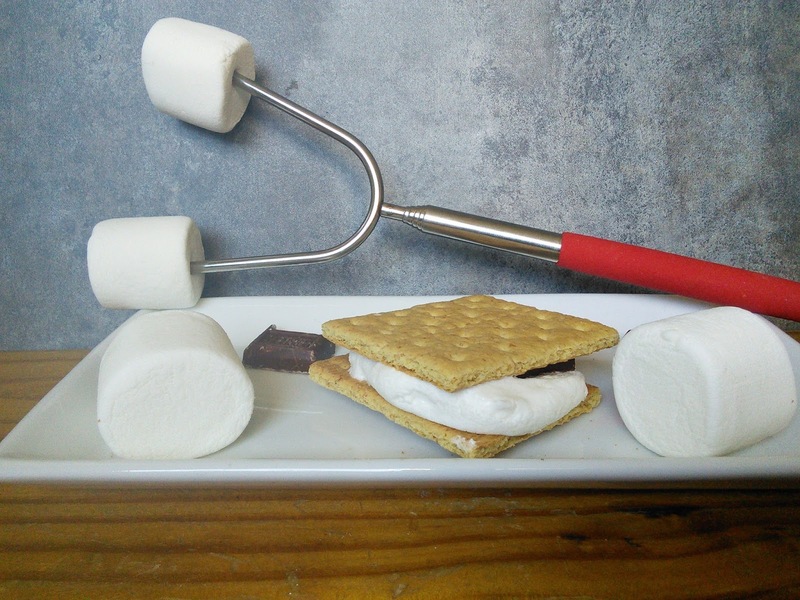 Seems like an amazing tool to roast marshmallows and perfect for camping! I need to buy one of these too! My wife loves camping and roaring marshmallows. This would be a great way to make a family memory! I like my marshmallows burnt and my wife likes them fluffy. Cool! We were planning to roast marshmallows soon! Way better than using sticks! I would like to get some of these. 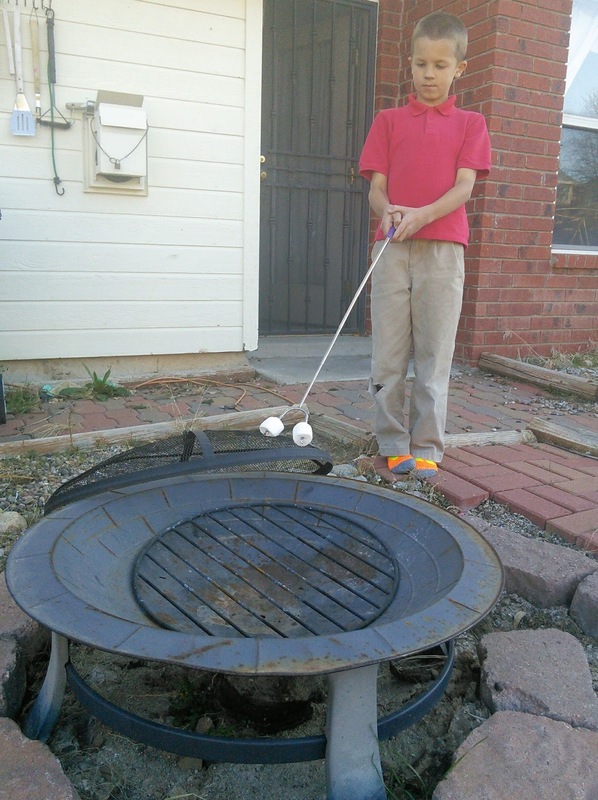 I love roasted marshmallows, and this is perfect for making Smores in the outdoors. The thought of using a stick when camping has always kind of grossed me out. This is such a smart idea! Safe enough that they can roast them, but also keeps them far enough away from the fire!